“The Obscure County Election That Could Change the Planet.” That’s how reporter Coral Davenport described the 2013 County Council election in Whatcom County, Washington, in the title of her May 2013 article in the National Journal Magazine. Davenport spotlighted the 2013 race for four seats on the County Council, and her article’s subtitle, “A little-watched race in Washington state will determine how America uses its coal—and the future of the global climate,” summed up the situation well. Whatcom County’s typically inconspicuous county election drew outside attention in 2013 because a 48 million metric ton per year coal export terminal, dubbed the Gateway Pacific Terminal (GPT), had been proposed at Cherry Point, in Whatcom County back in 2011. The company wanting to build and operate GPT is Pacific International Terminals (PIT), a subsidiary created for the project by SSA Marine (SSA), one of the largest shipping terminal operators in the world. 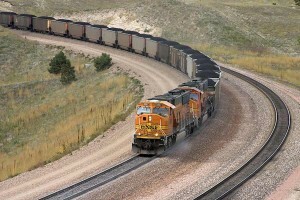 During the 2013 Whatcom County elections, according to the Washington Public Disclosure Commission (PDC) website, SSA/PIT, BNSF (the railroad that would transport the coal from the Powder River Basin to GPT), coal companies and coal terminal interests dumped $149,000 into the affiliated pro-GPT political action committees; SAVEWhatcom and Whatcom First. SSA/PIT and BNSF also contributed money ($30,000 from PIT and $10,000 from BNSF), by way of the Washington State Republican Party which funneled money to the Whatcom County Republican Party, which then funneled money to the coffers of the four conservative county council candidates. Those campaign contributions by coal terminal interests in 2013 were an attempt to sway the outcome of the election toward four conservative county council candidates, who were thought most likely to approve the permit needed for the GPT project: Ben Elenbaas, Kathy Kershner, Bill Knutzen, and Michelle Luke. The majority of voters, however, rejected those coal-interest funded candidates, and chose instead to elect four progressive candidates to the County Council who were thought to be more prone to protect the environment, and less likely to approve the permit needed for what would be North America’s largest ever coal terminal, GPT. 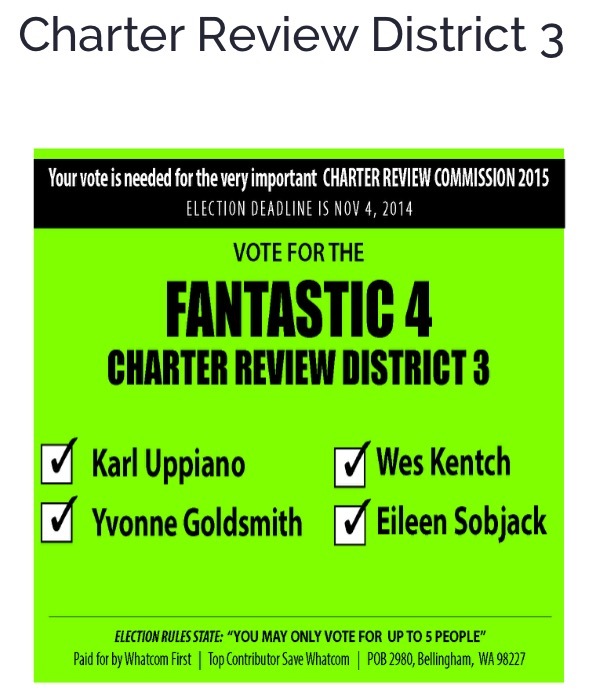 Those four progressive candidates elected to the council are Carl Weimer, Rud Browne, Barry Buchanan, and Ken Mann. County, in which again, something politically obscure which could have far-reaching implications for the planet would come into view. 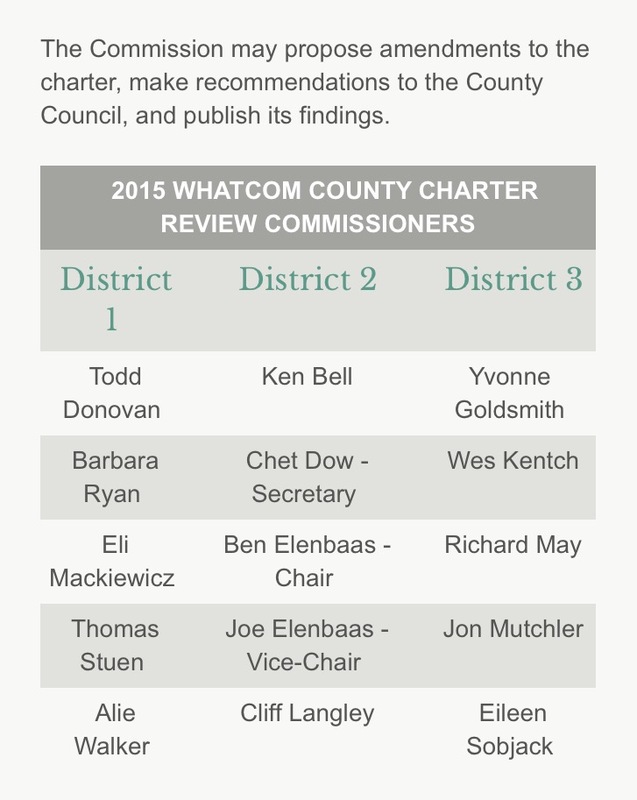 Many voters of Whatcom County had never heard of a governing body called the Whatcom County Charter Review Commission that only comes up for election every ten years. That ten-year mark was 2015, so in the 2014 election, voters needed to elect fifteen commission members. Voters in each of the three county districts could only select those candidates who live in their district, for up to a total of five candidate selections. The way that the districts are drawn has resulted historically such that District 1 votes Democratic, and Districts 2 and 3 lean Republican. The commission meets from January to July during the same year in which they are sworn into office. The commission can propose amendments to the county charter and make recommendations to the Whatcom County Council. The amendments approved by the commission are then forwarded to the election ballot of that same year for voters to approve or reject. While opponents of GPT may have breathed a momentary sigh of relief after the 2013 County Council election, SSA/PIT continued moving forward with the next phase of their plans toward gaining approval for the construction of GPT. 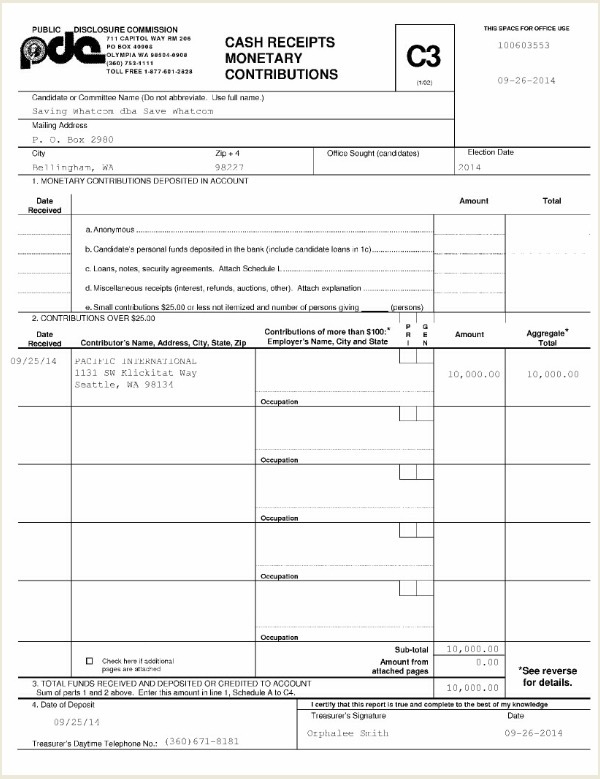 PIT contributed $10,000 to the SAVEWhatcom PAC on September 25, 2014 (which was then funneled on October 2, to the affiliated PAC WhatcomFirst). This contribution revealed SSA/PIT’s effort to ensure that the 2014 county Charter Review election would result in a conservative and likely pro-GPT majority on the commission. 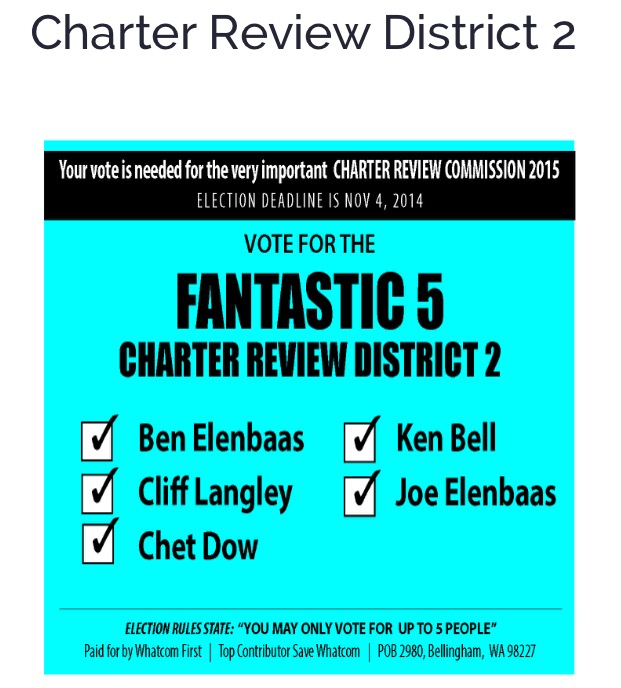 That effort proved successful because eight conservative candidates were elected to serve on the 2015 commission. According to PDC online reports, every single conservative candidate running for the Charter Review Commission received the benefit of independent expenditure advertising from the pro-GPT SAVEWhatcom/Whatcom First PACs. Also, it should be noted that in the 2014 election, each Charter Review Commission candidate chose “mini reporting” on their C1 Candidate Registration forms, which stipulates that those candidates would raise and spend no more than $5,000. By mini-reporting, candidates then do not have to disclose the contributors and dollar amounts for their campaign funding to the public. —Charter commission members are elected by district and the three districts in Whatcom County are drawn such that there is a disproportionate representation for Bellingham which historically votes Democratic and represents approximately half of the county’s population. —The campaign funding from SSA/PIT and the pro-GPT Whatcom County Republican PAC toward advertising for the conservative Charter commission candidates gave them an advantage. —Voters had a delayed realization that an effort to propel a conservative majority onto the commission was underway that could affect the make-up of future county councils. 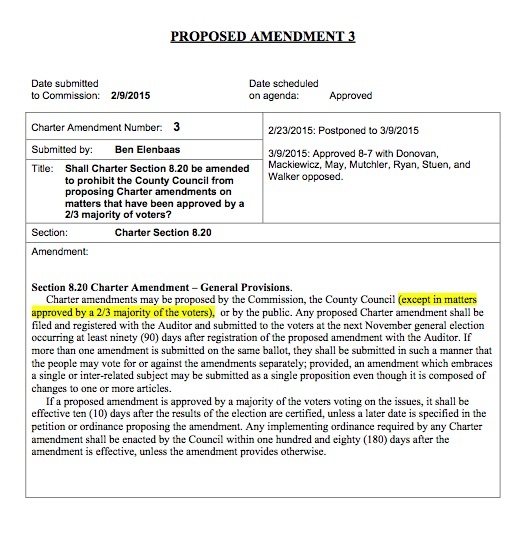 The very first amendment of the 2015 Charter Commission, Amendment 1, [now Proposition 1 on the November 2015 ballot] proposed on January 26, by conservative commissioner and Vice Chair Joe Elenbaas, reflects the significance of SSA/PIT’s efforts to affect the Charter commission election. 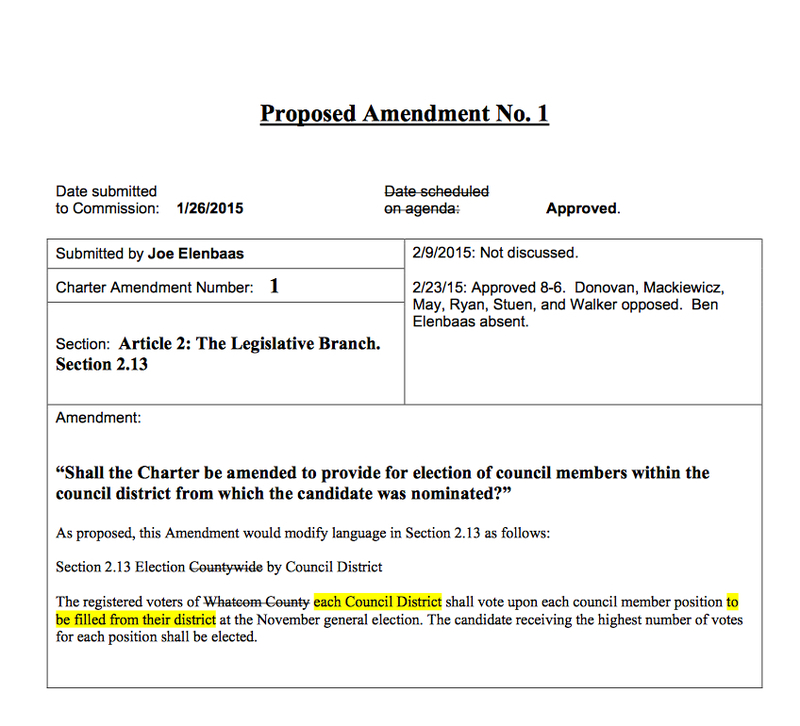 The amendment proposes district-only voting for County Council members in the general election. That would mean each voter would only be allowed to vote for the council offices representing the district in which the voter resides, and the at-large council office when those are up for election. Currently, in Whatcom County’s general election, each voter can vote for each council office from each district, regardless of the district in which the voter lives, and for the at-large council office when those are up for election, thus allowing voters to elect County Council members county-wide. If approved by voters, Amendment 1 [Proposition 1] would result in disproportionately minor representation for the city of Bellingham and would render Bellingham voters mute to a large degree, when voting for County Council members. For thousands of county voters, four out of seven of the County Council candidates would effectively be made off-limits. Amendment 1 was brought up for discussion by the commission only once, which was at the February 23 meeting, and that discussion by commission members lasted only about 24 minutes. Vice Chair Joe Elenbaas was acting as Chair pro tem at that time after commission Chair Ben Elenbaas (Joe Elenbaas’ nephew) left the meeting early. Chair pro tem Joe Elenbaas, who originally proposed the amendment, called for a vote and Amendment 1 was approved 8-6. It was a hasty process with no opportunity provided for the public to comment after having only heard, for the very first time, what the commissioners themselves had to say about the proposed district-only voting amendment. After the first commission meeting in January, the conservative commissioners created a storm of amendment proposing which produced 11 amendments in the first month, making it almost physically impossible for an individual to comment on each amendment in the 3-minute individual time allotment during the public comment period at commission meetings. The public was forced to triage the amendments, picking those that they felt most passionate about. For example, triaging became very difficult for people after Amendment 7 was proposed on February 9, by conservative commission member Yvonne Goldsmith (the amendment originated from then-County Council member Sam Crawford). 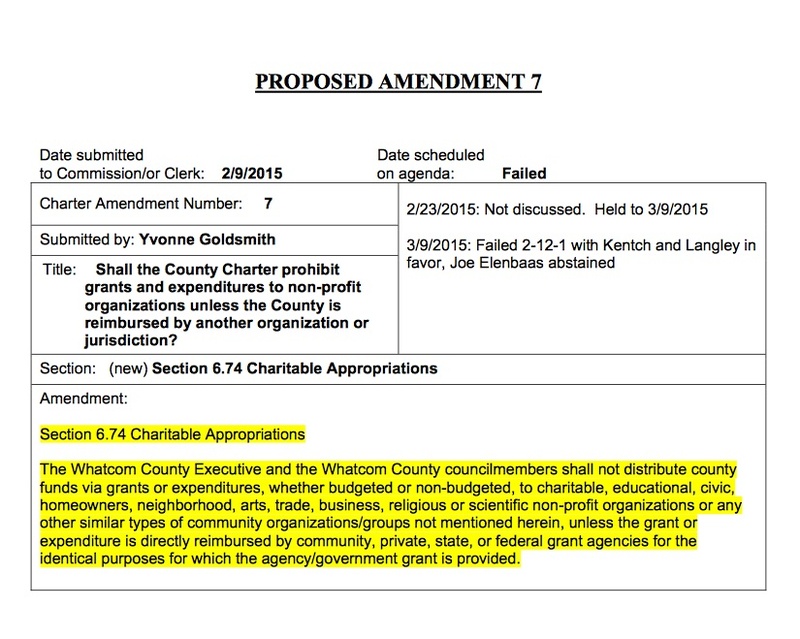 Amendment 7 would prohibit grants and expenditures to non-profit organizations such as the Bellingham Food Bank, the Whatcom Council on Aging and its Meals on Wheels program, and other non-profit groups unless the County is reimbursed by another organization or jurisdiction. There was an outcry from the public after a February 12, 2015 Bellingham Herald article reported on the news of the proposed Amendment 7, which prompted a large number of people to show up to the February 23 commission meeting to testify to the commissioners. The public testimony lasted about two hours, much of which was heartbreaking and emotional—real stories from real people about how such an outlandish proposal could be devastating for so many in our county. Amendment 7 was voted down 2-12 (Joe Elenbaas abstained) at the March 9 meeting. Because Amendment 7 was such an emotionally-charged issue for so many, and deservedly so, almost all of the public comment period of that February 23 meeting focused on Amendment 7; this did not allow ample opportunity for public testimony on Amendment 1. The district-only voting versus county-wide voting for County Council members is particularly important to coal terminal interests because of their unsuccessful attempt in the 2013 county election to seat four conservative candidates who are likely pro-GPT, which would have resulted in a majority leading into the permit decision for GPT. This is a power grab by these conservative Charter Commission members. What they [the commissioners] are proposing is minority rule. They want to set up a scenario based on the way the districts are gerrymandered to make it so that about 45% of the voters of the county would control 4 out of 7 of the seats, and it’s clearly not fair. That’s kind of the core problem. It’s pretty clear that it’s an industry scheme to try and get control of the council–and it just needs to be rejected. An opportunity or an ambush? Petryni acquiesced and then testified (on behalf of RE Sources) to the commission that night, expressing opposition to district-only voting. Immediately after Petryni’s testimony, Ben Elenbaas proceeded to dominate the platform, with a combination of speechifying, proclamations, and interrogation aimed at RE Sources’ April 9 “Action Alert” email the group had disseminated via its email list, asking its supporters to attend the April 13 Charter Commission meeting. Petryni was basically stuck standing at the microphone while Ben Elenbaas conducted his personal quest. Ben Elenbaas subjected Petryni and the audience to a lengthy regurgitation of that April 9 “Action Alert” email, refusing to stop even when some audience and commission members called out to him multiple times attempting to return protocol to the meeting. In his grilling of Matt Petryni at the April 13 Charter Commission meeting, Ben Elenbaas took an opportunity to proclaim to everyone in attendance that he “never took a penny from anybody.” Assuming that in using the term “anybody,” Ben Elenbaas meant “coal interests,” that proclamation is misleading, and not quite accurate. 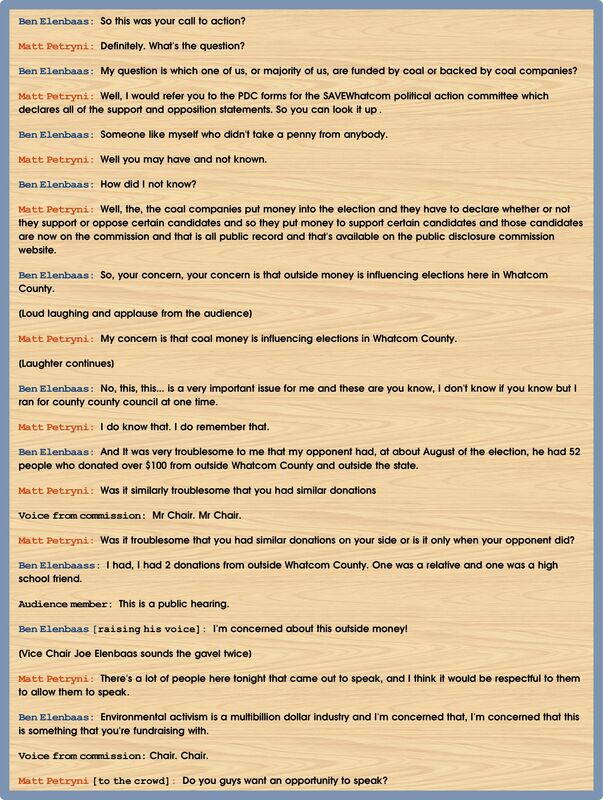 As evidenced in the PDC reports, Ben Elenbaas and the rest of the conservative commission members may have not received monetary contributions toward their 2014 Charter Commission campaigns directly from coal interests, but the PDC reports clearly confirm that each conservative Charter Commission candidate received the benefit of independent expenditure advertising from SAVEWhatcom/Whatcom First PACs which had received $10,000 from GPT applicant, SSA/PIT. They [Ben Elenbaas and many conservatives] are focusing on the outside [interests] and not talking about the coal interests. Corruption in our government happens when interests with a vested financial stake in what the government does, try and control that government. Corruption doesn’t happen because public interest groups are successful in representing the public interest. . .Taking money from the coal interests is significantly worse than having the backing of environmental groups, because environmental groups don’t have anything to gain other than a clean environment which we all benefit from. But, the coal industry gains something at the rest of our expense, and having them influence our government is just a lot worse. Nobody is claiming that they [conservative Charter Commission members] have taken bribes–what we’re claiming is that the coal industry was interested in seeing these people elected because those people are willing to represent their interests, and they [coal interests] are willing to spend money on the election to make that happen, and that’s what’s wrong. . .They can’t deny that there was money spent in their favor using the election, by the coal industry. It’s documented in the PDC. Also, it is important to note that in the 2013 County Council race, Ben Elenbaas was the recipient of tens of thousands of dollars in independent expenditure advertising by the coal interest-funded SAVEWhatcom/Whatcom First PACs, and he received monetary contributions from the Whatcom County Republican PAC, and from the Washington State Republican PAC which had received contributions from coal terminal interests. Another member of the public who testified at the April 13 meeting who found herself in the crosshairs of Elenbaas irascibility was local Bellingham citizen Lisa McShane. 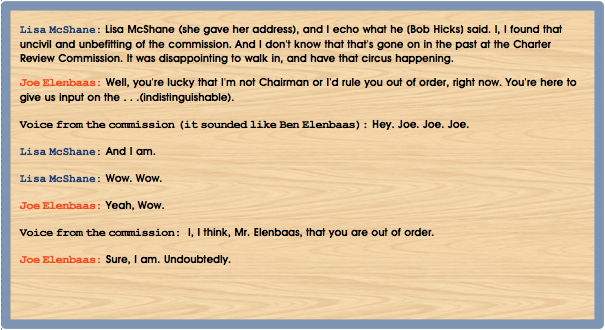 In this case, the Elenbaas taking aim was Vice Chair Joe Elenbaas, who interrupted Ms. McShane’s public comment as she was voicing her opinion about what she felt was behavior “uncivil and unbefitting of the commission” that evening. When asked if she thought Joe Elenbaas’ treatment of her public testimony might have been intimidating to some who were thinking of giving a public comment, Ms. McShane said: “I guess, that my perspective afterward was that was deliberate—Joe’s a smart man. And, I think he wants to intimidate and bully the public. . .and it was hard to stay and give my testimony.” She said that after that happened, she observed more people who then got in line to testify, and that “similarly, after Matt Petryni was weirdly called up to the microphone by Ben Elenbaas, a lot of people went and got in line.” She explained that she had planned on giving a comment at the meeting, but that after she witnessed what happened to Matt Petryni, she was even more resolved. Although Joe Elenbaas’ attempts at intimidation backfired at the commission meeting, in that his inappropriate behavior galvanized more people to step up to testify, he is no stranger to intimidating behavior as some long-term Whatcom County residents may remember. 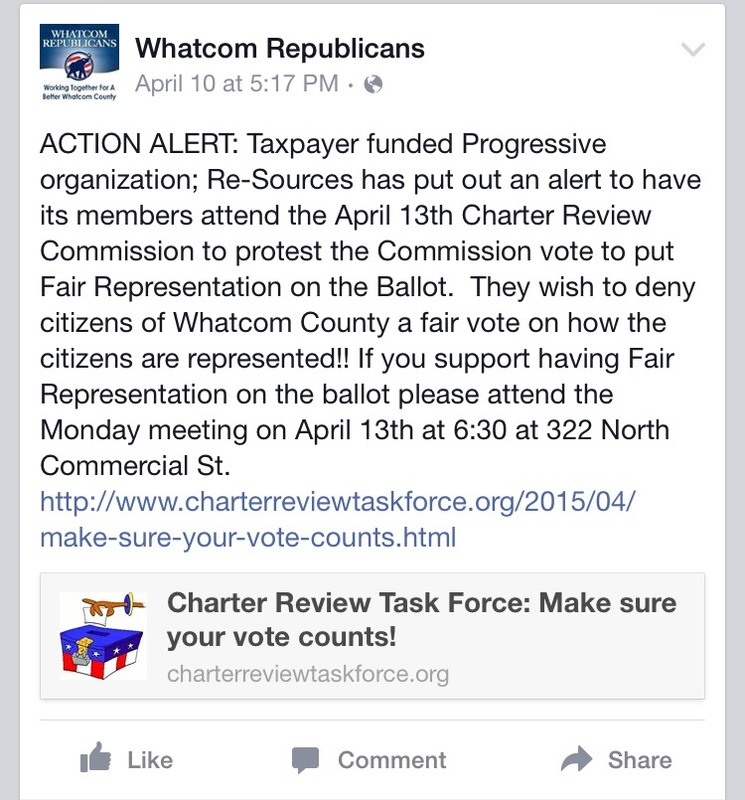 The turbulence of the April 13 Charter Review Commission meeting spotlighted the import of why Whatcom County voters need to pay close attention to the Charter Review Commission and the fourteen amendments they’ve proposed thus far. This includes the amendments that have already been approved (six, so far), because the commission can still change or rescind its amendments prior to its final meeting in July. That significance was reiterated by RE Sources’ Matt Petryni, in his phone interview when he stated that more people need to notice and pay attention to what he feels is the non-legitimate process that is currently being conducted by the commission, and that people need to speak out about it. Even though coal terminal interests were not successful in the 2013 election in getting their preferred conservative candidates voted onto the County Council, this back door path, via the Charter Review Commission, may still enable GPT interests to attain their goal of stacking the County Council toward a favorable GPT permit decision by returning the county to district-only voting. Hoping to insure the longevity of district-only voting in our County Council elections if Amendment 1 [Proposition 1] were to be approved by voters in November, two amendments related to that were proposed by conservative commission members: Amendment 3 , proposed on February 9, by Commission member and Chair Ben Elenbaas, and Amendment 10 , proposed by Commission member Chet Dow on February 23. The commission has already passed both amendments 3 and 10 [that have become Propositions 2 and 3 respectively on the November 2015 ballot]. 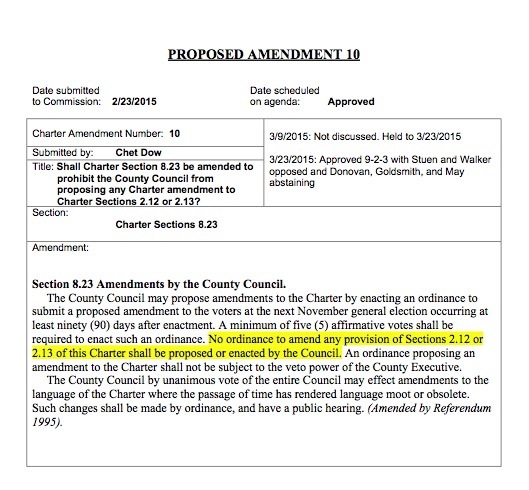 Amendment 3 prohibits the County Council from proposing charter amendments on matters that have been approved by a supermajority (2/3 majority), and Amendment 10 prohibits the County Council from enacting any ordinance to amend sections in the charter pertaining to County Council elections. 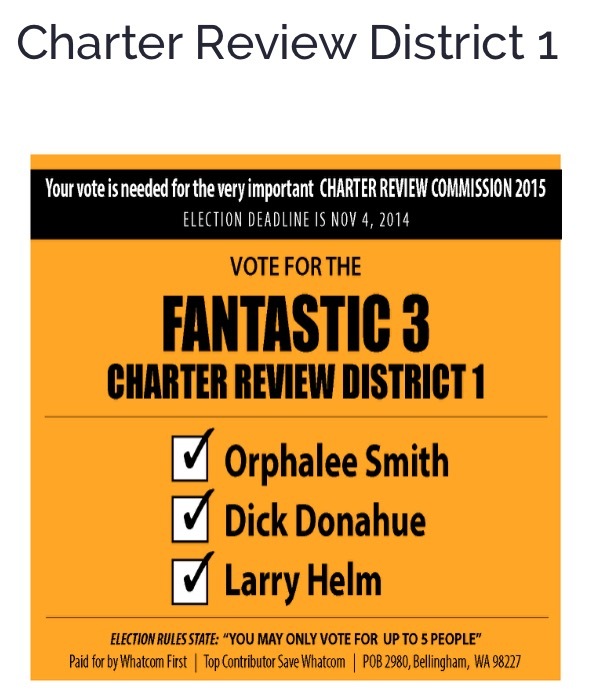 Think of amendments 3 and 10 [that have become Propositions 2 and 3 on the November 2015 ballot] as if they are deadbolt locks on district-only voting [Proposition 1], in essence, locking-out indefinitely, any chance for a reversal of district-only voting in County Council elections, if it were to be approved by voters. If intimidation and lies were the consistent tools of an individual trying to gain support for their plan those tactics would not be tolerated. When an industry/political party relies on bullying, cheating and lying to push their agenda should the response be any different? 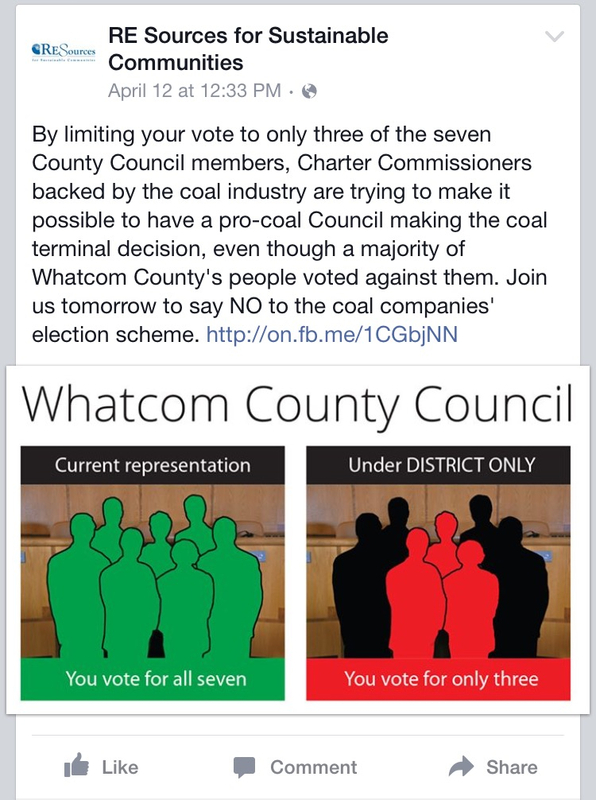 Everyone should be at the Ferndale Public library tomorrow night at 6:30 to let the Charter Review Committee know that they work for the people of Whatcom County, not the coal industries hence their sleezy tactics and disrespect __will not__ be tolerated. Thank you Sandy for another stellar investigative article. Let’s Facebook the hell out of this!! You have performed a real public service; thanks for the hard work! Brilliant as usual, Sandy. Thanks so much for providing the truth to what is really before us! Great job!